When you visit Mount Rainier National Park you are embarking on a journey that captures the essence of Washington with its waterfalls, flowering meadows, mountains, rock climbing, hiking, and lush forests. 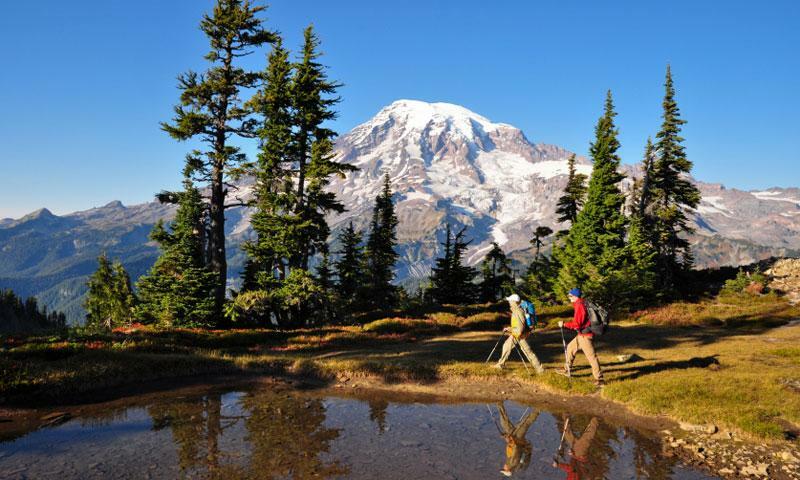 What can I see and do at Mount Rainier National Park? Mount Rainier National Park is a huge park that is broken down into five areas that give you the opportunity to see different parts of the mountain and enjoy different activities. These areas are called Longmire, Paradise, Ohanapecosh, Sunrise, and Carbon/Mowich. While the Paradise area is the most popular, each area within the park is rewarding and unique. Fall Hikes: Bench Lake and Snow Lake hikes are easy 2.6 mile roundtrip hikes for families that provide you with the opportunity to see beautiful fall colors. Pinnacle Saddle is a 3 mile short, steep roundtrip hike with a view of the Cascade Mountains and good fall color viewing. Cross Country Skiing: With 50 miles of trails that transverse the whole park, you can explore Mount Rainier National Park Washington on your cross country skis. Each visitors center within distinct park areas has specific information on the cross country skiing in that area. Summer Hikes: Alta Vista Trail (1.2 miles roundtrip), Chenvis Falls (6.4 miles roundtrip), and Greenwater Lakes Trail (4 miles roundtrip) are great summertime hikes for groups who want to see wildflowers blooming. Lodging/Camping: Each approach area has different types of lodging and campsites available for visitors to use. Some of the sites like Longmire only have one campsite that is open limited times during the year while others like Paradise have a small inn that is open limited times during the year for lodging. Where is Mount Rainier National Park? Located about 90 miles southwest of Leavenworth, Mount Rainier National Park WA is difficult to get to from Leavenworth. Specific entrances are only open during non-inclement times of the year and access requires that you take specific routes that are not accessible from all directions. If you are visiting in the summer, the most direct route from Leavenworth is straight south. From Leavenworth follow Hwy 2 south to Hwy 97. Take Hwy 97 to Yakima and then head west on Hwy 12. Turn right onto WA 123 and into the southeast entrance at Ohanapecosh. This drive takes about 3 hours. During the winter, drive back through Seattle and to the southwest entrance. How much does visiting Mount Rainier National Park cost? Entrance into the park costs $15 for each private, noncommercial vehicle or $5 for each visitor 16 or older entering by motorcycle, bicycle, horseback, or foot. These fees give you a 7 day entrance permit to the park. Other special activities require special permits that must be applied for 2 weeks in advance. For more information please call (360) 569-6575.